Owing so much inspiration from his childhood teachers, most notably Jim Metzger and David Rentschler in his native Lancaster, PA, the important task of developing the next generation of teachers is a vital part of Eric Berlin’s career. Artist-Teacher of Trumpet at the University of Massachusetts since 2001, Professor Berlin is teaching future educators with a unique blend of his own instruction and personal experience. Although trained by premier orchestral players and teachers, he also credits his experience as one of Boston’s premier private instructors for young musicians as integral to his teaching. Gaining national and international renown through competitions and a stellar record of job placement for graduates, the trumpet studio at UMass is a thriving place for study of Music Education, Performance and Jazz. 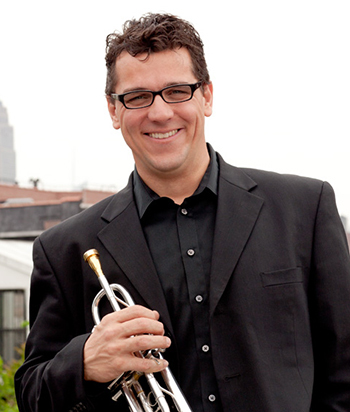 Please visit Professor Berlin’s Blog where he discusses all manner of trumpet topics. Please also visit the UMass Trumpet Studio’s page at www.umasstrumpets.org. This page is designed and maintained by students and is a great place to see what is happening there.